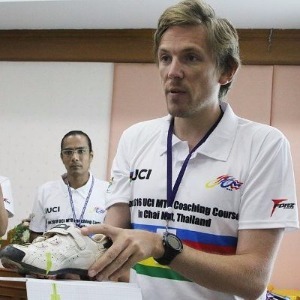 James is an experienced MTB coach and is one of only a few coaches to achieve the UCI Coaching Diploma. He has worked with all level of riders from complete beginners to World Cup riders. James is also a MTB expert tutor for the UCI, this sees him delivering their coach education courses all over the world to aspiring MTB coaches. High Rise Coaching offers performance and skills based mountain bike coaching to those wanting to improve all aspects of their riding and fitness. We have experience of working with a full range of ages and abilities, ranging from those new to performance coaching to elite level World Cup racers. If you want to hit your local trail faster and stronger, or get on the podium we have the skills, experience and qualifications to make this happen. James is never happier than when out on his local trail or mastering a new skill, and this passion transfers into his coaching. James has a strong understanding of coaching, skills and training principles, however his coaching style will not baffle you with exercise science, its simple and very affective. This is also carried over to his strength and conditioning programming. Over the past year this has produced great results for James and the riders he works with. Success. Coach James Scott has been notified of your message.